It has been a very moving day as we acknowledge the fallen and contemplate the new environment that the Christchurch mosque attacks has placed our society in. I think our core kiwi values have come to the fore, but it has made me question how individually, and collectively through organisations like Rotary, we can make a difference in promoting cross cultural understanding. We had a lively meeting last Monday, beginning with a great 5 minute talk from Nic Russell on the work she is doing to support families. The following link is for Luka’s video which encountered technical problems on Monday https://youtu.be/cBQhyW_Nr54 and more information about Kenzie’s Gift can be found by going to the following website https://kenziesgift.com/supporting-you/deargrief/. Then we heard from Holly Bennett, who talked about the topical subject of Government advocacy, where she is taking a unique approach. Next Monday we have two speakers from the Auckland Health Foundation - Gwen Green is the CEO and Hannah Davies their Fundraising and Marketing Manager. This recently established organisation goes beyond what is presently funded in the healthcare system and through donations, financially supports projects, research and education for adult health services, which have the capacity to transform healthcare. I hope to see you all tomorrow. As well as our key-note speaker, we will also have our Honorary Member Bishop Ross Bay giving the 5 Minute speech. And we are still accepting children’s Christmas presents if you would like to make a donation, that will be forwarded onto the Auckland City Mission to distribute. And there are three remaining Christmas Puddings available for purchase at $20 each, which people can buy for themselves and/or to donate them, also to the Auckland City Mission. 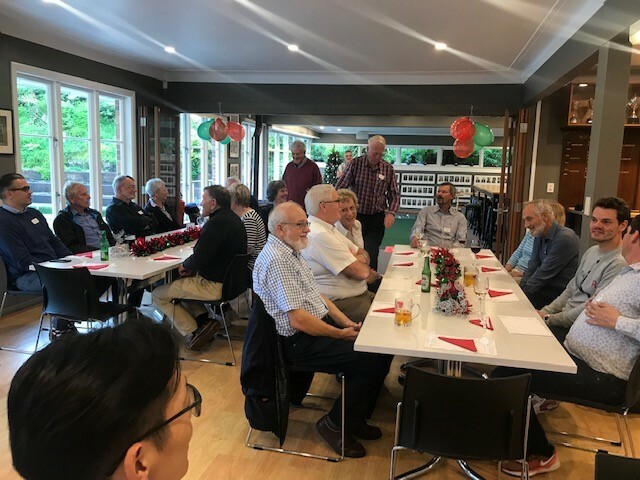 A great night was had on Monday at the Auckland Bowling Club for our End of Year Bowls & BBQ Evening. Even though the outside lawns resembled watering holes due to the wet weather, we were able to hold an indoor bowling competition. 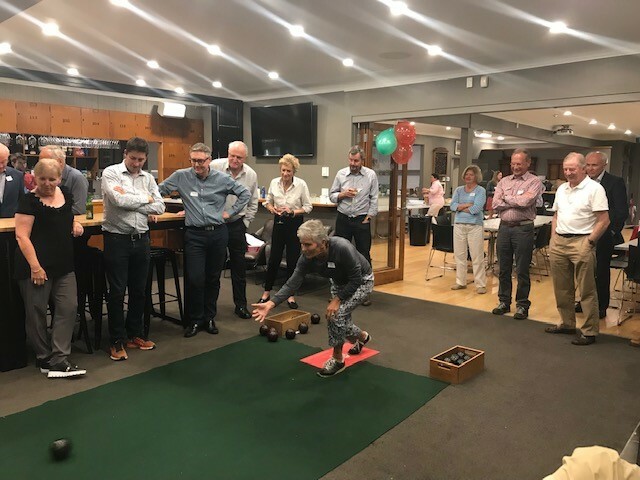 Congratulations to the winning team of Brett O’Riley, Robyn Walker, Craig Brown and Stewart Germann and runner-ups were Jim Johnston, Deirdre Johnston, Chris de Boer and Sue de Boer. Many thanks to those members who worked tirelessly behind the scenes, to ensure everyone had a great evening and great food – Kaye Shannon, Lindy Esslemont, Denis Black, Peter Lavelle, Monika Levinson and Jackie Hinchcliff. It is that time of year again to think about getting organised for Christmas and what better way to start, than by ordering some Rotary Christmas Puddings, whether for yourself or to donate to a worthy cause, or to do both - this year will be donating puddings to the Auckland City Mission. Puddings are now packaged in a heat-proof bowl (though I still have some in tins if anyone prefers). These puddings are still $20 each, with $5 being donated to our Club, so please contact Jacqui in the office if you would like to place an order – they can be purchased in any quantity (and come in cartons of six). On Sunday 27 January 2019 the SkyCity Breakers Basketball team will be celebrating their community heroes and volunteers when they take on the Brisbane Bullets at 2pm at Spark Arena in Auckland. As this is their community game, they would like to offer Auckland Rotarians a special $10 ticket offer, as a small thank-you for all the hard work we do in our communities. Please contact Jacqui in the office if you are interested in this promotion. The Rotary Club of Auckland has again been fortunate to be selected as one of the organisations to receive (with minimal effort on our part, other than attendance) the proceeds of an auction to be held at the 2019 Chinese New Year Charity Dinner at the NZ Bloodstock Karaka Million Meeting at Ellerslie on Saturday 26 January, organised by the NZ Chinese Jockey Club. Tickets are $240 per person or $2300 for a table of ten and included in this price is magnificent views of the racecourse, a gourmet buffet and beverages. Dress is black tie. Please support this event as it is a significant fundraiser for our Club. Many thanks to Ally Cui and Yi Ping Ge for all their work in making this happen. Call Jacqui on 09 486 6010 or office@aucklandrotary.org.nz for tickets.